Wonderful post Anne. Yes, they are our partners and we need to appreciate the work they do for us everyday! I love hearing everybody's comments about this wonderful horse without feeling grief! What an interesting piece, Anne. School horses... who knew? Honored to be celebrating Sandy in the now! What a great story. It made me think of Lucky. Whenever I had kids come over to my house, Lucky was always willing to take them for a spin. He was so incredibly trustworthy with beginning riders, and always careful about them. If anyone became unbalanced, he would immediately stop and wait for them to get situated again. And he always acted like he really enjoyed it. I love that you are celebrating Sandman! What a great horse he is indeed.It was Sandi that helped me learn to trust myself after being tugged around by my own horse. Sandi carried me around the circle so carefree and I was able to relax finally without having to fight with the reins. Then you told me to drop the reins! What? I did drop the reins and Sandi kept up that smooth trot, relax..... then you said drop your stirrups also....Sandi kept up that smooth trot. You and Sandi then showed me how to stretch and relax and put my body in the correct position. He is smooth like butter! To this day I am amazed when I watch him give a lesson, he just trots in the perfect circle, I can't even walk in as perfect a circle as he can trot and he does this effortlessly.He is so smart about his lessons you have to spell out words at times, he knows where you are in the lesson!He is even a great teacher to children who question his differnt appearance with one eye. 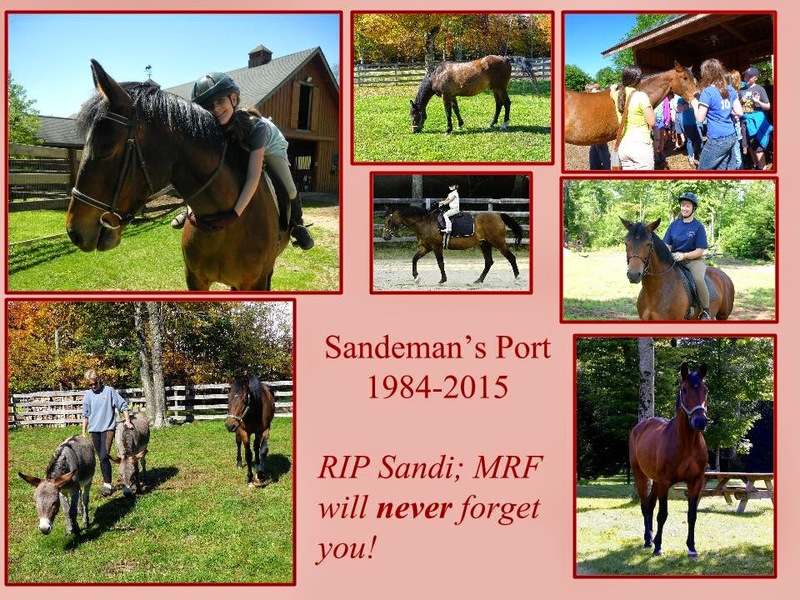 He has lugged many of us around and never has a poor attutude about it, he is just a love.I just wish Sani could read and know that we all do appreciate and love him so, extra carrots and hugs will have to do!He truly is a special horse, Love ya Sandman!!! !